To all our Ethiopian readers and to the rest of our readers across the world, for in these days and times we are all connected, myninjaplease on behalf of the entire mnp group would like to wish you a Happy Millennium. For those of you who don’t know, the Ethiopian Calendar is based on the Coptic Calendar which is based on the Alexandrian Calendar which is based on the Egyptian calendar. In this time frame, September 11th represents the last day of the second millennium. 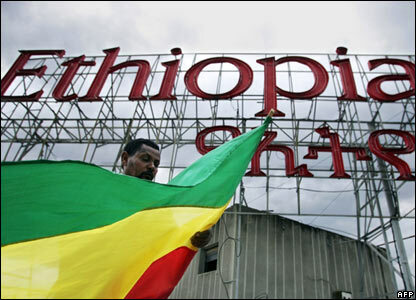 Celebrations began at midnight today, Ethiopian time. Consequently, the BBC has a short slideshow about the millennium from which the above picture was linked. Though many are celebrating, some have called for a boycott of the activities due to what they see as government mismanagement. The author of this article calls the celebration a diversion to shield the government from criticism, if only for a moment. Still, the festivities continue. Many people see it as a chance to revitalize a country that seems to trail behind in many important indexes. Regardless of what you think about the issues at hand, check out the trailer for the Ethiopian Millennium film about Haile Selassie I. Previous PostRWU: Rich White Underachievers to Racist White Underachievers?Next PostDemocratic Bumper Stickers for 2008!